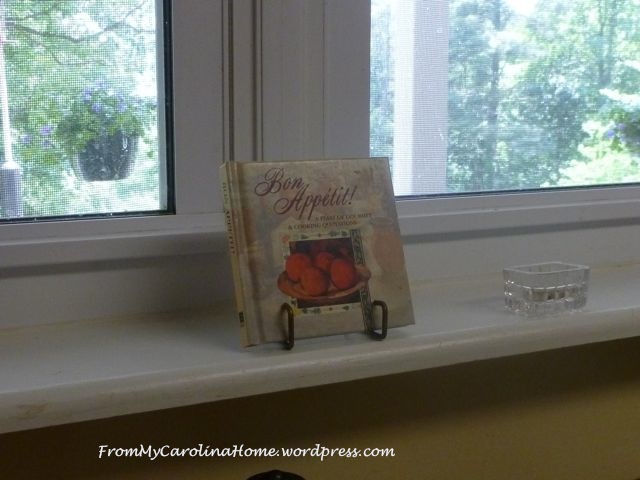 On July 28, 2014 July 22, 2014 By Carole @ From My Carolina HomeIn Books and Reading, Decorating, Foodie! I love to read, and I have a huge To-Be-Read pile. To keep the ones I have read and want to keep, along with all the ones I want to read under control, I use books to decorate. They are literally all over the house. 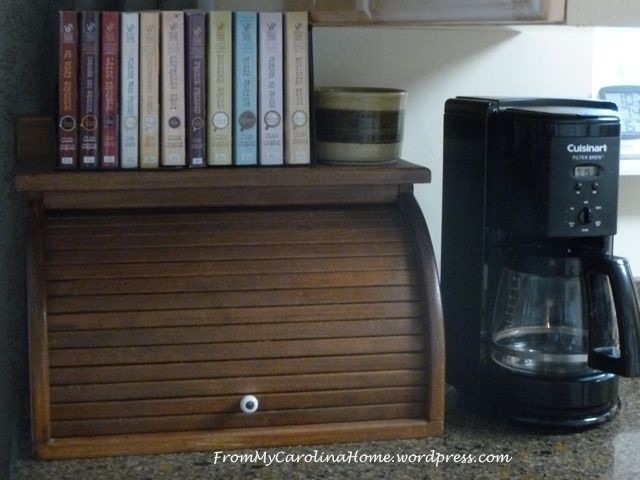 Here are some of the ways I use books as decor. Today I’ll focus on my kitchen, and next time I’ll show you some of the other rooms. 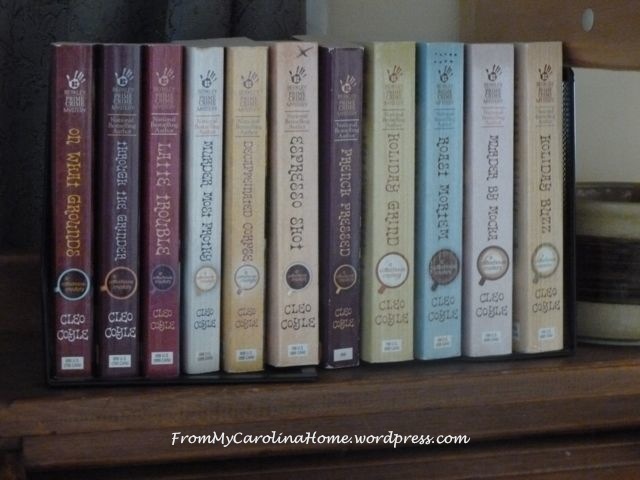 I really enjoy the Coffeehouse Mysteries by Cleo Coyle. It only made sense to put them near my coffeepot! These are wonderful cozy style mysteries with the protagonist owning a coffee house called Village Blend. The books progress nicely with the background story of Claire Cosi, her ex-husband coffee buyer Matt, her eccentric ex-mother-in-law Madame, and of course, cop-boyfriend Mike Quinn. There are a lot of coffee facts in the books. For instance, I learned that the darker the roast, the less caffeine in the cup. Interesting!! There are some recipes as well. I am eagerly awaiting the next in the series. If you like this kind of mystery with recipes, check out Mystery Lover’s Kitchen. Cookbooks are a given in a kitchen, and I have a lot. Plus, I have a little kitchen, so most are on a bookshelf just outside the kitchen. I use the top of that shelf as a display area, and a book is on a stand. I change that book regularly to fit the season. Summer is Farmer’s Market veggie time. 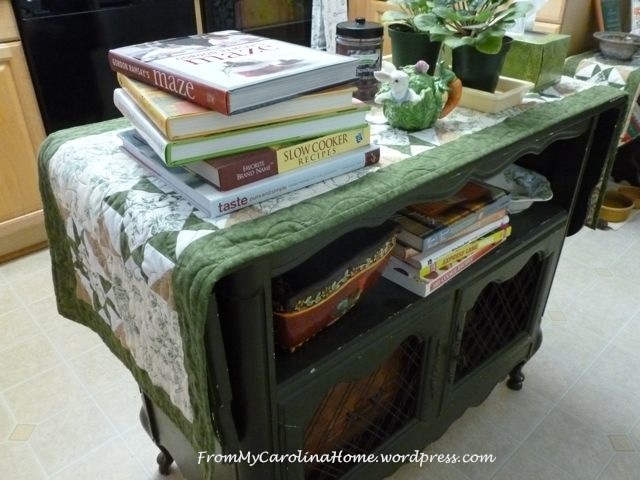 Same goes for the little library table that is at the end of the cabinets. I change this display for the seasons too. Have you read The School of Essential Ingredients? I highly recommend it! 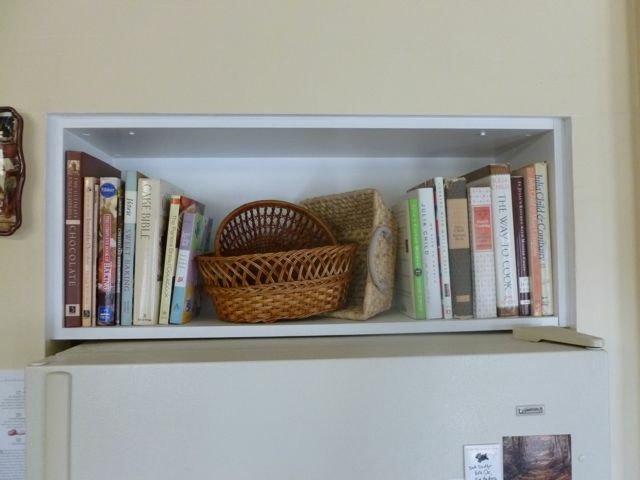 In the center of the kitchen is a little pie safe, and I use it to stack books on as well. My best idea was to remove the doors from the cabinet over the refrigerator and use that for book space. My collection of Julia Child books is on the right. 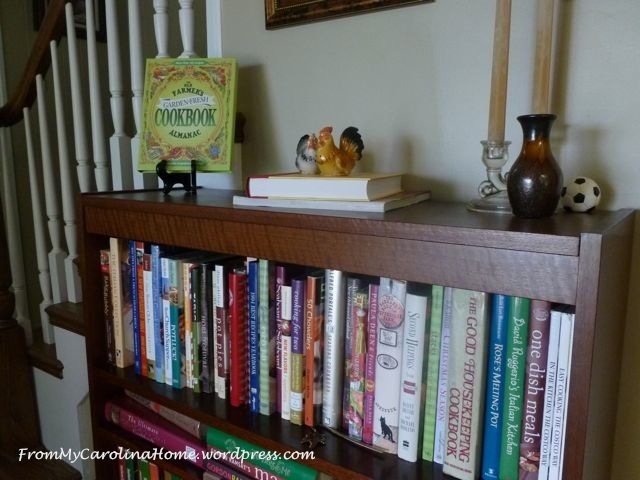 On the left are dessert cookbooks and baking. A few baskets complete the display and help hold up the books. 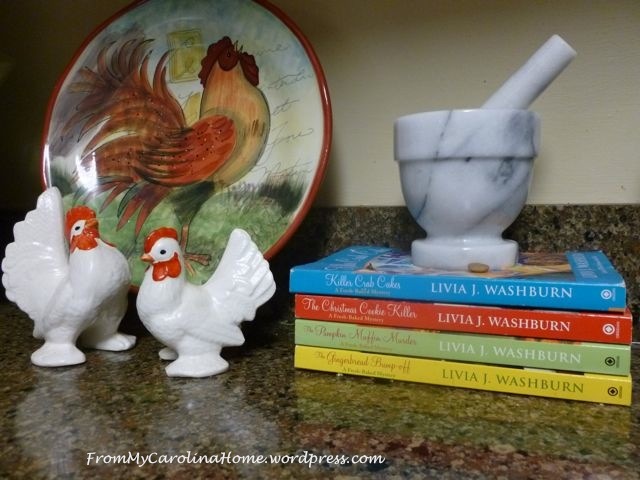 Under the mortar and pestle is a stack of Livia Washburn Fresh Baked Mysteries. I am collecting these in the trade size, and I need a few more. Another delightful cozy mystery series with a retired teacher Phyllis Newsom as an amateur baker and sleuth. More Recipes here too! Do you have any of those tiny little books? They look great in a tiny stand placed on a windowsill. Yes, all that is crammed into my kitchen! I wish I had room for my collection of every one of Diane Mott Davidson’s Culinary mysteries, but my kitchen is just too small to get 17 hardback books on the counter. The recipes in her books are wonderful and I have tried most of them. I particularly like Scouts Brownies from her second book, Dying for Chocolate, YUM!! Reminds me of my house….books everywhere. My motto is that you can go anywhere in the world as long as you have a book. I love to read, too! We just remodeled our living room to add in a large bookcase behind our sofa! 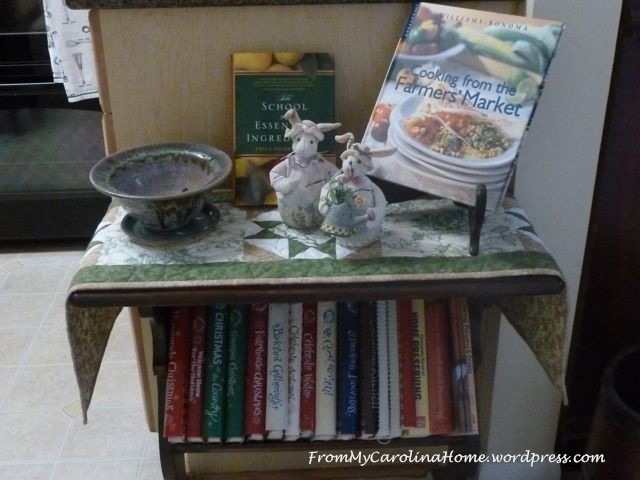 Looks great, Carole! I enjoy using books as decor too and am always interested to see how others use them.